I was reading the current issue of American Motorcyclist last night on how riding (or hiking) in the woods can revitalize and recharge a person. It’s based on research out of Japan that found phytoncides (wood essential oils) have beneficial effects such as boosting the immune system, reducing stress, and improving mood (Ledbetter, 2015). The studies can also be found The Journal of Environmental Health and Preventative medicine (January 2010 volume). Whatevs. All I know is, being in nature has always made me feel good, but I figured I should test this out, just to be sure. 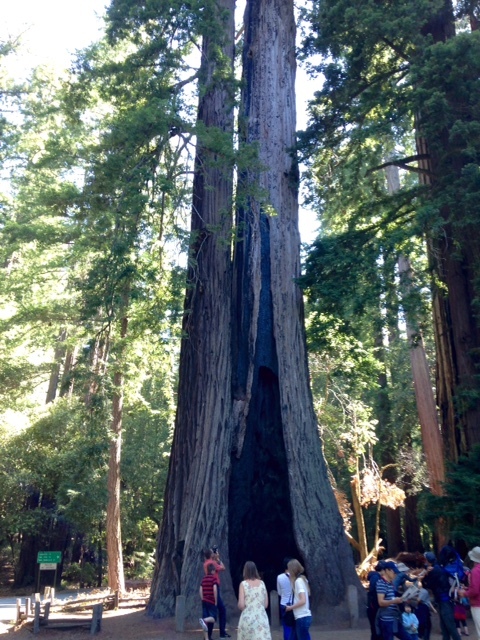 What better place for healthy forest immersion than Big Basin Redwoods? The roads to get there are amazing so not only was the destination going to be awesome, the journey would be equally rad. I left Oaktown early and made my way across the San Mateo bridge. While it is an unremarkable bridge, it is cool that it’s the longest bridge in California. 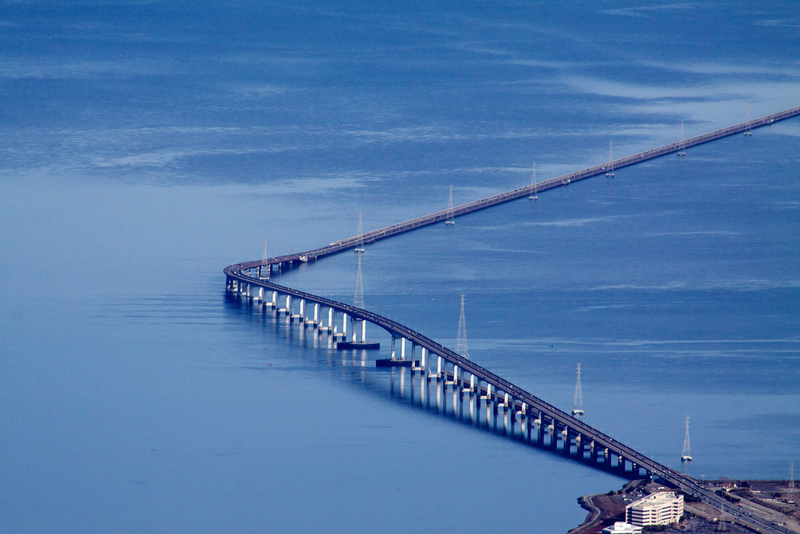 It links the San Francisco Peninsula with the East Bay and that baby is seven miles long. It feels like you’re riding on top of the water. Now everyone can feel like Jesus! Once over the bridge, it’s not long until I see my turn off for Hwy 35 (Skyling Blvd.). This is one of the most popular motorcycle roads in the Bay. The word highway makes it sound big, but it’s a curvy, two-lane road that starts out big and open, then winds through the forest as you go further in. I meander down Skyline, watching my temperature guage go from 65 down to 57 degrees in about 5 miles. 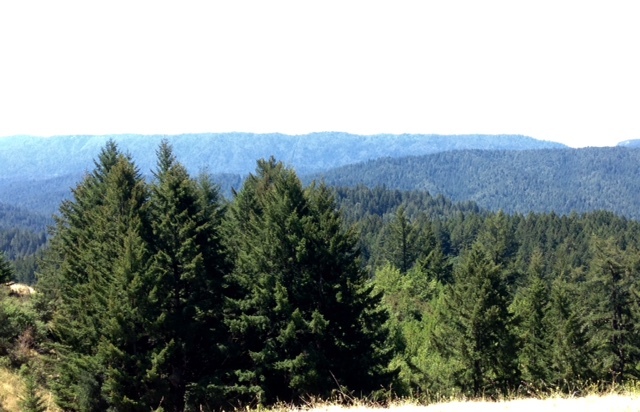 It’s beautiful riding through this forest of Cypress tress, young Redwoods, and Pine trees. They are all surrounded by slow-moving fog as the breeze pushes it in and out of the branches. Bright fuchsia wild flowers make the roadside even prettier in the low morning light. I stop by Alice’s Restaurant (popular motorcycle hangout) to top off my tank and chat with a few other riders doing the same thing. I head back out to 35 and enjoy the long sweeping curves. I make a turn for Hwy 9 which is another gem, and shortly after connect to Big Basin Hwy, CA-236. This road is one of twistiest I’ve ridden in a long time. 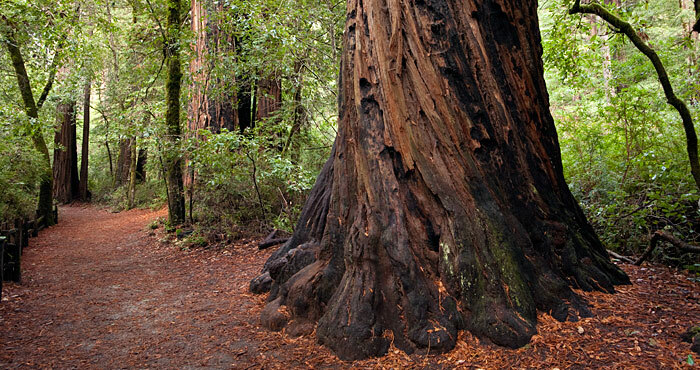 It winds through 17 miles of ancient Coastal Redwoods and goes right through one of the oldest State parks in California (est. 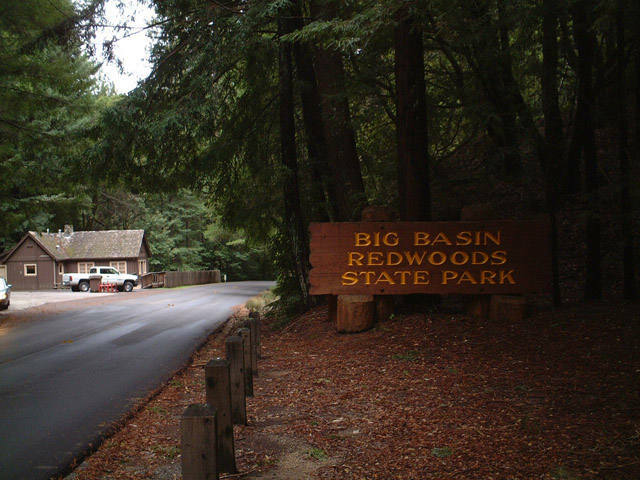 1906), Big Basin Redwoods State Park. They kept this road narrow to preserve the Redwoods so riding through here feels like you could reach out and touch one–so beautiful. I would not recommend this road for beginners, it’s pretty technical, and if you want to look at the scenery, best to pull over and do so. Arriving into the park I am immediately met by this giant beauty. I tried to wait until people would clear from my photo shot, but after 15 minutes, I realized that was not going to happen. 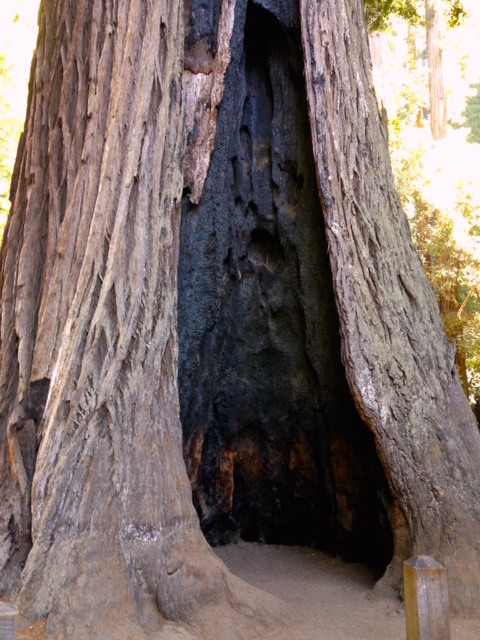 While this is one of the most spectacular places to see ancient Redwoods, it also is one of the more crowded parks. Once you get further in, the people seem to spread out and you will have some space. 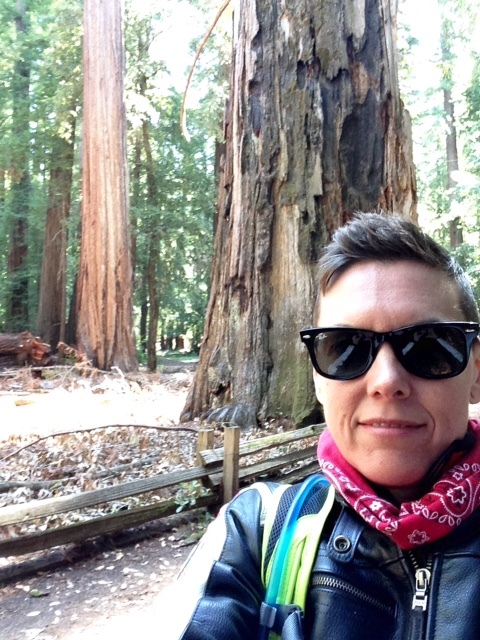 That’s a Redwood trunk behind me. Bigger than most, I’d say. Bigger than an apartment in San Francisco. Probably better parking too. 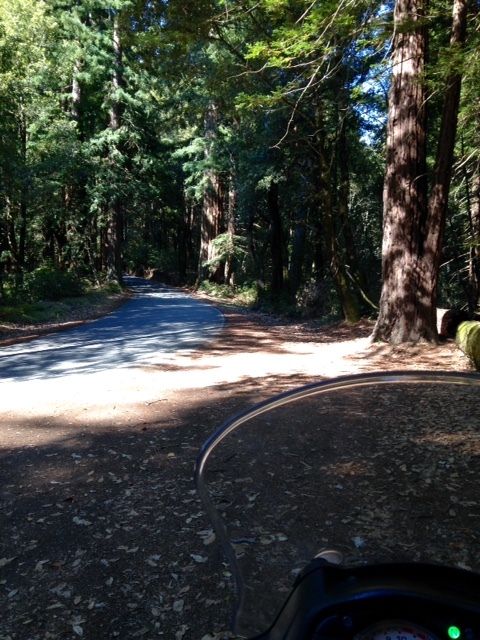 After hiking around for a while, I got back on my bike and continued on Big Basin Hwy. The road straightened out a bit more on the ride out but still just as beautiful. I did the full loop, and headed back up 9. I stopped off to eat my lunch at this wayside vista. 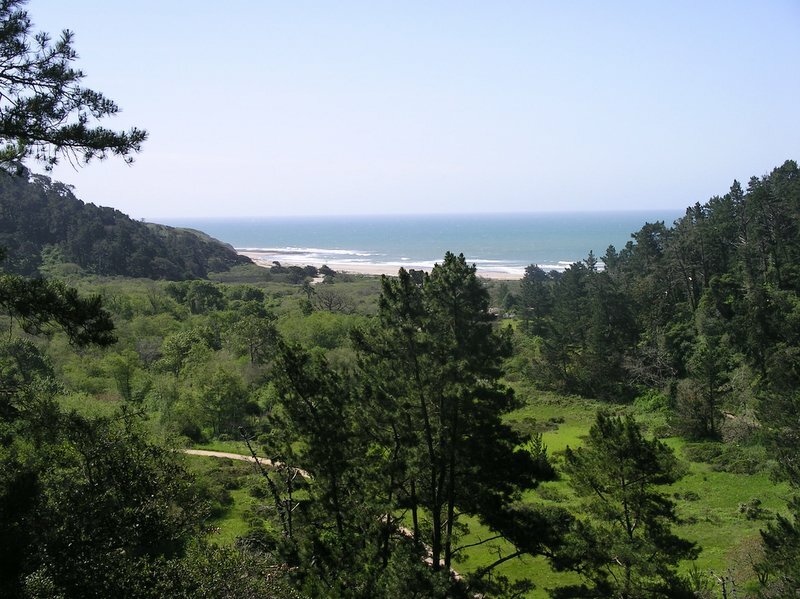 It had a stunning view of the forests and Santa Cruz mountains. Just then, a young woman rode up on a Honda Rebel. She asked if she could join me for lunch so we shared a picnic table and chatted for a while. Her name is Rian, and she was headed on Skyline to meet her Fiance who was going to trailer her bike for the rest of their drive home. He was out surfing near Half Moon Bay while she was out riding. Pretty cool. 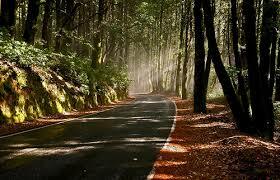 They now live in Ashland, OR and she said there are some great roads there with hardly any cars. Makes me want to pack my bags. We exchanged emails and she told me to look her up if ever I was in their neck of the woods. I love how motorcycles can bring people together. She took off as did I, soon after. I enjoyed my way back on 35, savoring the curves, one after the other. After that it was a short 30 minutes home on the freeway and I was thinking how nice it felt to get out in nature. I would agree with the Japanese and can attest that shinrin-yoku (forest bathing) really is beneficial. Whether you’re walking through the trees or riding through them. Go try it! Ledbetter, J. (2015, August). Natural Exposure. American Motorcyclist. Looks absolutely stunning. Can’t wait to Forest bathe soon!